On a wintry day in Kallio, a bohemian neighborhood in Helsinki, a group of Finns huddle outside on wooden benches, clad only in towels, steam rising from their bodies, drinking beer, relaxed. This is the conclusion of their ritual at Kotiharjun Sauna, a wood-heated sauna built in 1928 for local factory workers. 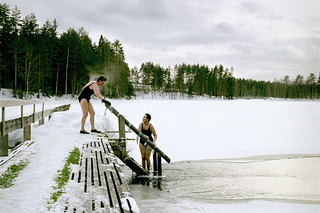 Here and everywhere in Finland, Finns take their sauna experience seriously. In this Nordic country of 5.4 million, there are some 3.3 million saunas, in homes, offices, airport lounges, and even parliament. This may be the ultimate form of relaxation, but it’s more than a way to soothe sore bodies. It’s a sacred tradition that dates back thousands of years, with clear rules and a deeply embedded belief that saunas are central to what makes a Finn a Finn. “It’s an essential part of our everyday life,” says Jussi Niemela of the Finnish Sauna Society. Whatever the setting, you begin in semidarkness while sitting naked. Water is tossed onto hot rocks, producing steam (löyly). A splash of cold water calms rising body temperatures, and a swat with birch branches improves circulation. But when the heat becomes too much, step outside for a roll in the snow or a dip in a lake.